So, let’s get right to it. I thank Katherine for sharing. 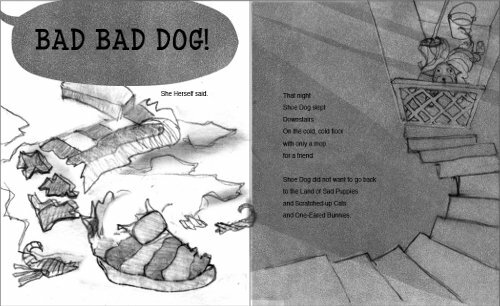 Katherine: When I begin work on a new book, it is always with small scribbly page layouts, but when I began work on the book Shoe Dog, I never expected that a small scribble would make his way to the final pages of the book. When Shoe Dog originally landed on the page, he was a bull terrier. 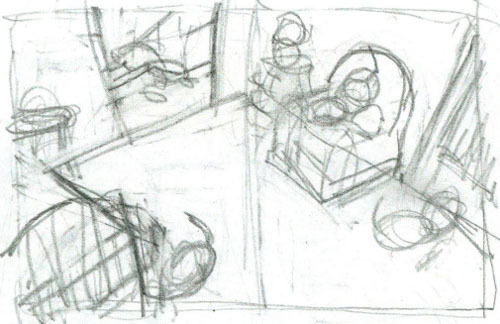 You can see him here in a couple early dummies for the book. 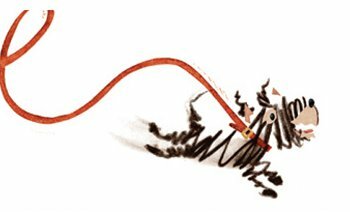 In the final illustrations, Shoe Dog still holds onto a smidgeon of terrier, but he is now little more than a scribble and a smudge. His essence. 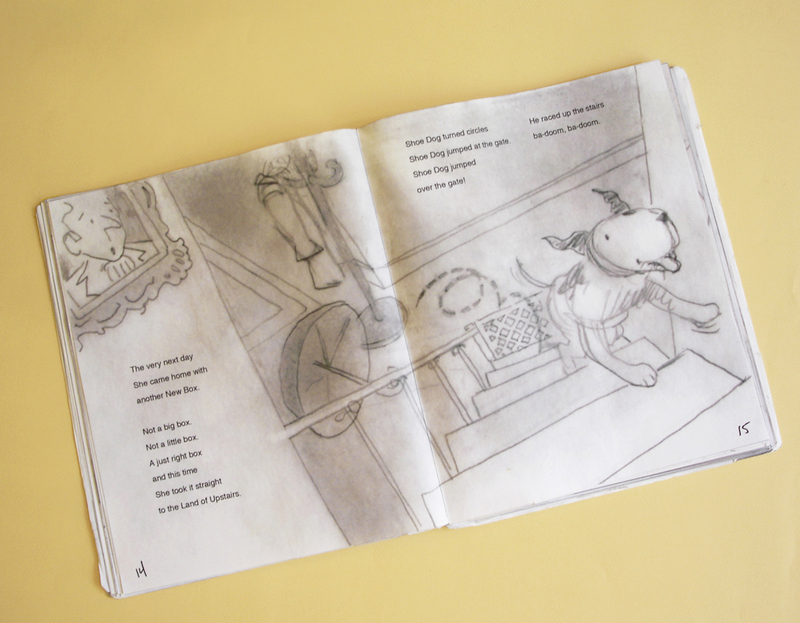 I used crayons, a square graphite pencil, and charcoal to build the illustrations. I will have to back up a little to describe the technique. 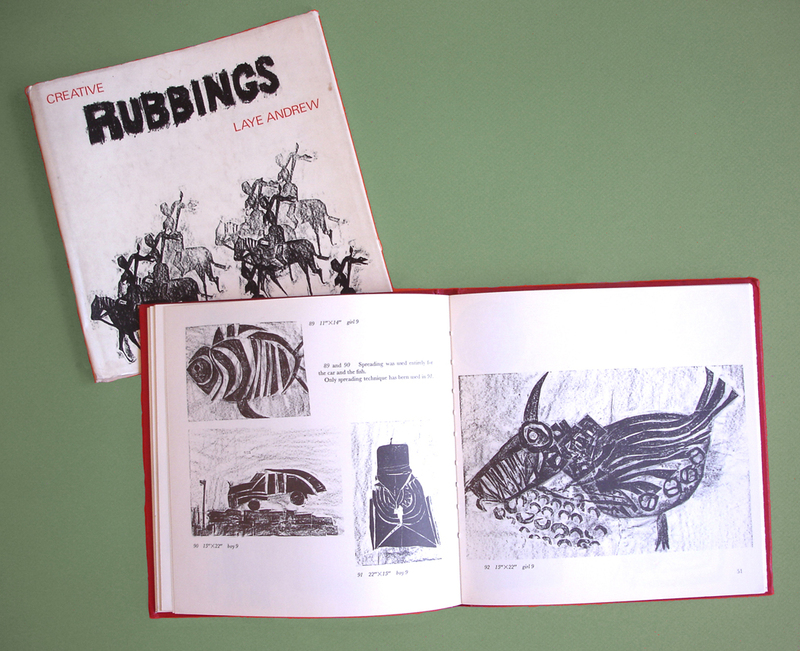 My friend and crit-mate, Christy Hale, introduced me to a wonderful book, Creative Rubbings, published in 1967. I found the techniques described in the book irresistible. 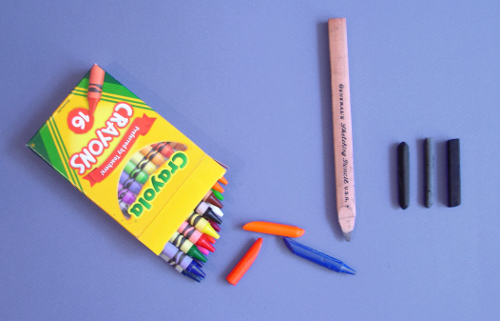 Shapes were cut out of tag board, and then a crayon was used to rub an impression, much as we place a penny under a piece of paper and rub it with graphite to create a flat rendering of that penny. 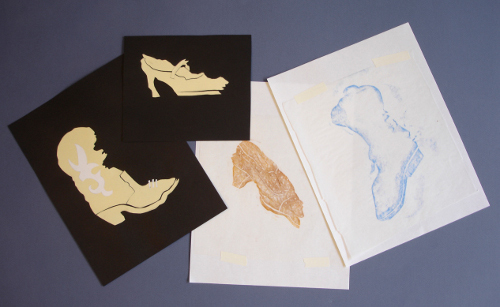 I loved the idea of using crayon rubbings to illustrate the world inhabited by the scribbly Shoe Dog. …but mostly I cut out shapes and then made rubbings. These are how the environments—the house, furniture, stairs, shoes, etc.—were constructed. 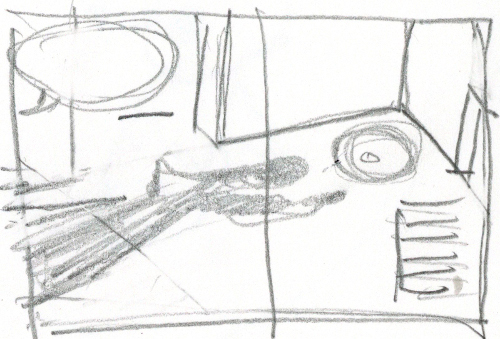 Black and white sketches helped me determine value before I rendered the final illustrations in color. The computer is a wonderful tool for collage, and Shoe Dog is basically collage. I scribbled and made crayon rubbings and then combined all the hand-made marks by using the computer. Thank you so much for asking me to show and tell. 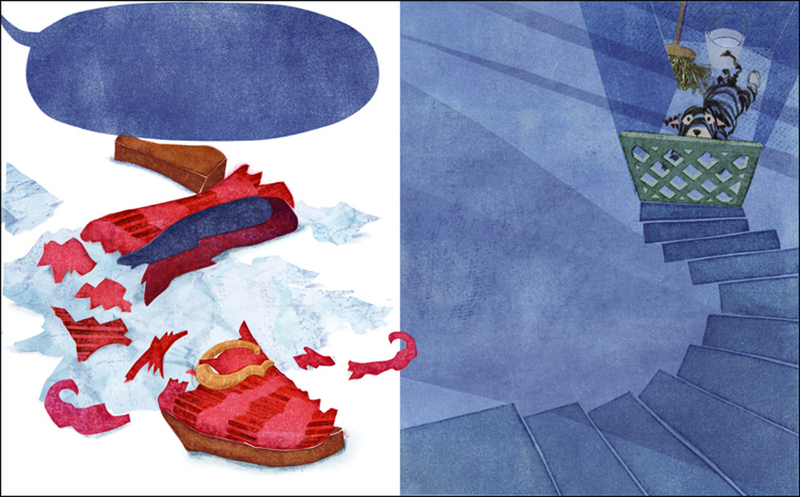 I had such fun creating the illustrations for this story! SHOE DOG. Copyright © 2014 by Megan McDonald. Illustrations © 2014 by Katherine Tillotson. Published by Richard Jackson/Atheneum Books for Young Readers, New York. All images here reproduced by permission of Katherine Tillotson. 1) I really love how an old, obscure book from 1967 gave Katherine such inspiration. 2) Because my oldest was home for three days this week (adenoid surgery), I got to see an awful lot of her. 4) A day out with the family yesterday to see Muppets Most Wanted. Very funny. 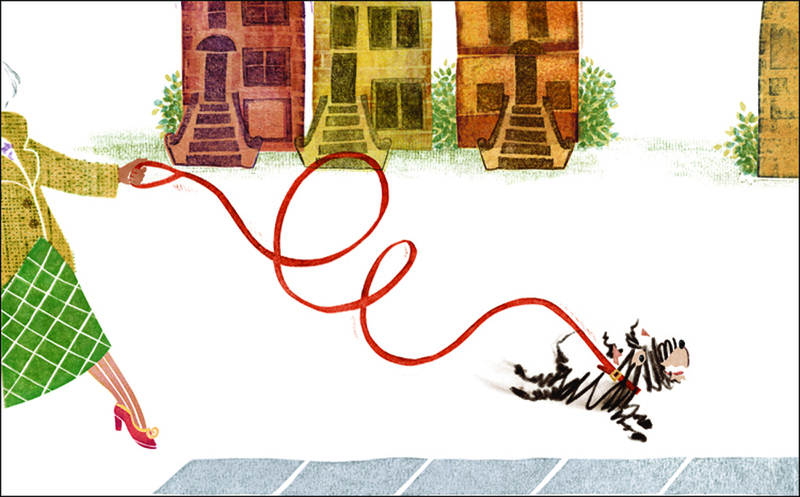 5) I got nice and unsolicited feedback about 7-Imp this week, which I really appreciate. In this day and age of rampant social media, I often stop to wonder if my blog is still relevant (I think this is a natural question for any blogger today; I promise I’m not just self-deprecating for fun), so to get compliments, ones that are truly informative, can be energizing. 6) Meg Wolitzer’s The Interestings. 7) I read a galley of E. Lockhart’s We Were Liars (a YA novel) in just about 24 hours. It’s a compelling novel, to say the least. 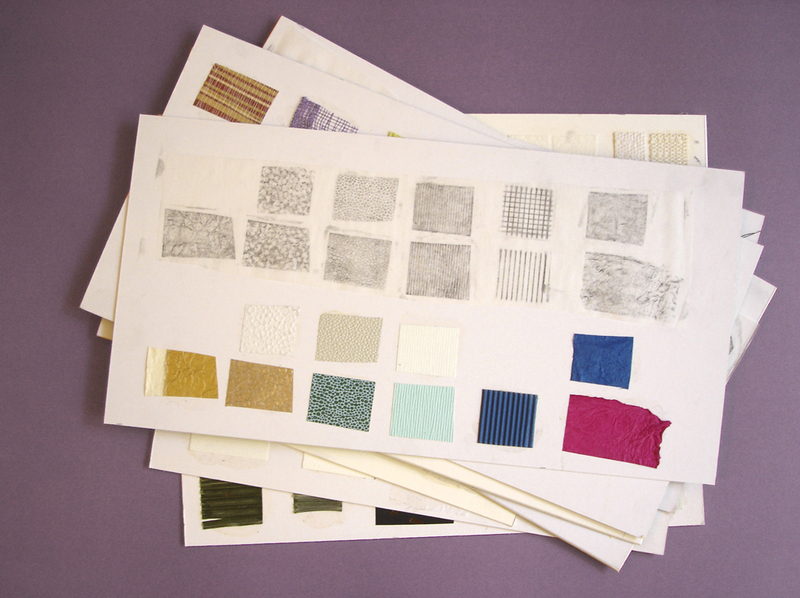 Thank you, Katherine for sharing your process. Your work is lovely. 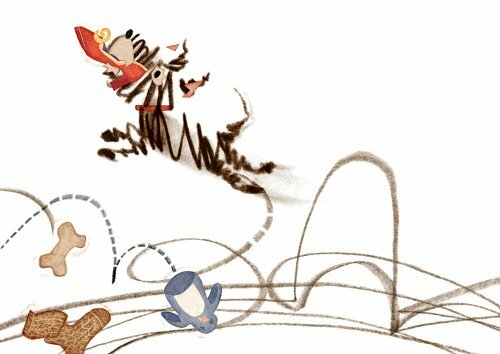 Jules – Long form blogging is still relevant when it is high quality and informative which Seven Imp most certainly is. Keep on keepin’ on. 1. Buying more art supplies because I am really enjoying working on paper with pen, brush, ink and watercolors. 2. I set up my new scanner. It has amazing clarity and I am excited to put it to good use. I am going to add some of the new work and want to fix up the place a bit. It’s kind of like taking a sledge hammer to a wall where you’d like to put a window. You’ve got to fix it one way or another. 4. I’m using Instagram to post my current work. I find it the least black-holeish of the social media right now which means more time to draw and paint. 6. Sneaking in the studio in the morning after the kids leave and before going to work. 7. Lots of great visits with food, fun, music, art and books this past week. I hope you all have a great week and may the road rise up to meet ya. Jules, I hope your oldest is recovering well and feeling much better; 7IT is truly inspiring to me; and I can't wait to get my hands on When We Were Liars! Moira, I'll be eagerly watching to see how you rebuild your website. 1) A beautiful weekend in SC with my brother to start our Spring Break. Such fun to walk around the state house grounds and talk about history. 2) Some gorgeous Spring-like weather finally! 3) A wonderful visit with my cousin and her family. Our kids got along amazingly well and the conversation flowed. 5) My kids go back to school tomorrow. Family time is awesome but I've got to get some work done. 6) Planning our vacations for this year and getting them on the calendar. 7) My nephew's team made it to the Sweet Sixteen and we're going to see him play next weekend! Wowser! I sure am glad I have this book on order. Thank you for sharing your process with us Katherine. Shoe Dog is one adorable pup. Jules: Glad you had a wonderful family outing. Shannon: Planning for vacations sounds like so much fun! It’s great to have those fun goals. 1. No big snowfalls this week. 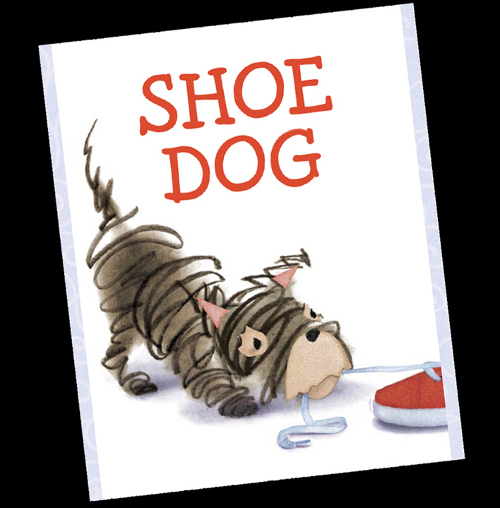 Shoe Dog looks like a book I need for the library. The dog is adorable. Jules, glad eldest is on the mend. 7 imp is relevant and I am thankful that we have a Sunday meeting place. There’s been a discussion about how many of the blogs that first participtated in Poetry Friday still participate. Moira, good luck with your new website and have fun with the new art supplies. Shannon, I have The Goldfinch on my TBR list. Yay for spring. 1. Participating in Ed DeCaria’s March Madness Poetry Tournament. Lost but so fun. 2. Saturday play rehearsal at school with a real sound system. A dad has volunteered is equipment and time. 3. The fifth grade boy who asked “how is fair librarian was” but then realized he meant favorite and proceeded to tell me he’s been at many schools. 4. And the fifth grade boy who was asking me about my favorite books, favorite books on tape, and what should he check out. 5. Oldest grand girl has email now and emails me. 6. More than 3/4 done with the Slice of Life Story Challenge at Deowriter. Thirty-one days of writing. 7. Weeding the roses and battling the blackberry vines. Hi Margie, enjoy the sunshine and walks with Xena. 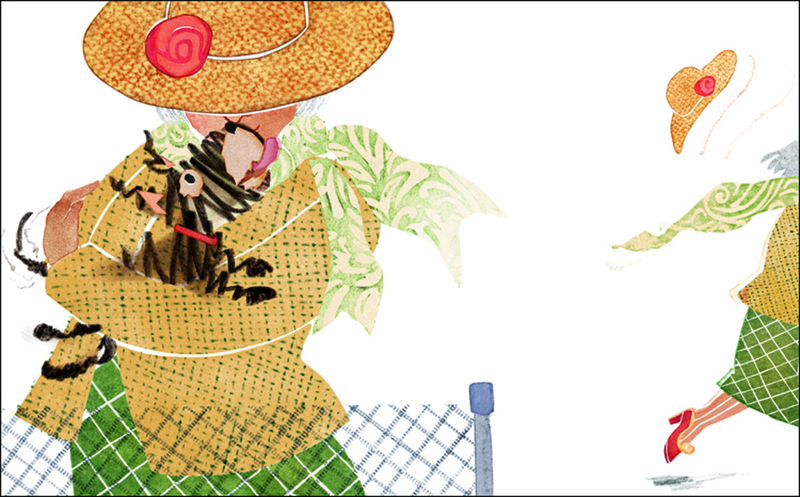 I agree, Sundays at 7 Imp are the best. Good morning, Imps! Hello to Shoe Dog, the adorable scribble and smudge that he is, and to his creator, Katherine. Thanks for sharing your artwork and your process with us! I like Megan McDonald’s stories. I’ll have to check out this collaboration. I like the textures. Jules: Sending hugs and healing thoughts to the post-surgery munchkin. I look forward to reading We Were Liars. Have you read Don’t Think About It yet? Yay for the nice feedback! Misty Copeland, ballerina and ABT member, tweeted my review of her memoir and I squealed. Moira: I am now singing Sledgehammer. Thanks, Peter Gabriel. Good luck with current projects and forthcoming illustrations! I always like seeing your work. Shannon: Congrats to your nephew’s team, and good luck to them! Glad that you enjoyed your visit and your breaks. Margie: A Snicker of Magic is in my to-read pile. What kind of birds do you hear most often? What does Xena make of the birds? Jone: Yay for communication and recommendations. And, of course, poetry. If I don’t have the time to read any other blog, I read yours for every new post…and to look back at posts from the past! It is unbelievably relevant to so many readers! You have such a wonderful way of sharing what you love, and have introduced me to many new illustrators and a lot of amazing music. Keep the compliments coming, IMPS! Jules… Your blog is my go to and what I learn from it has been shared with colleagues from North America to the Middle East. Your entries are at the root of my choices when I have created book orders, most recently for a school library on the other side of the world. We had the luxury of the entire order being picture books and again that was informed by your wonderful blog. I cannot wait to read about a newly released work and it is so inspiring to be allowed in to the working worlds of the illustrators and writers. Merci, Merci, Merci. 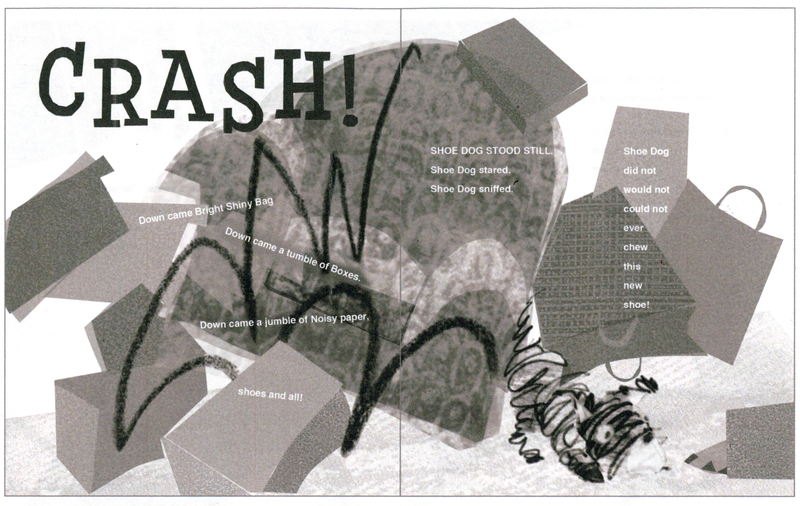 Shoe Dog is adorable and so energetic and full of personality. This is definitely going to be a gift for some upcoming birthdays. Katherine, thanks for sharing your wonderful smudgy creation and his story! Jules – hope the oldest is recovering well. And 7Imp is my one never-miss-it blog. I am forever referring friends with young kids to your site! Moira – yay for good food and good visits. Loving the art on Instagram! Shannon – congrats to your nephew – have fun at the game! I loved The Goldfinch so much I have given it as a gift to 5 of my favorite people so far. Margie – no snow, sun, birdsong and walks with Xena sounds like a great week. LW – congrats on the tweet-out of your review! Sounds like another non-stop week for you! 1) Sun & time to work in the yard and garden. 3) Friday night’s dinner of Bluefin tuna with shiitake mushrooms, water chestnuts, brussel sprouts and habanero sauce – yum! And a nice Oregon pinot gris to go with it. 5) Spring cleaning & a trip to Ikea. 6) Finished Winter’s Tale. Didn’t love it, but wished it would’ve realized its potential. 7) Early morning coffee with a good friend. In the winter it’s the chickadees which have been singing loud and strong. They are so cheerful even on the coldest days. This morning I am pretty sure I heard some finches. The birdsong is not noticed by Xena. She takes it in stride unless its a huge group of geese flying overhead. This time of year large groups of birds pass the area on their way to their spring home. YOU ALL! Thank you for the nice blog compliments. And, yikes, I hope I didn’t sound like I was fishing for them. Anyway. I appreciate the kind words. A lot. Moira: So neat that you’re having more and more fun with your drawings. And I didn’t even KNOW about that podcast. COOL. Shannon, good luck to your nephew — and I picked up The Goldfinch the other day, but didn’t get it. I should have. Maybe it can be next adult-fiction read. Margie, aw, thanks for your last kick. I liked A Snicker of Magic too. … I am hoping you see Spring soon. Jone, when’s the show going to be? And what script is it? Love your fourth kick. LW: Nope, I haven’t read Don’t Think About It. Who wrote that one? Cheryl: Thanks to you too! I’m so glad you find it helpful. Rachel, early morning coffee with a good friend is pretty much one of life’s top-five best kicks. And what a good week you had. Sounds like you’re doing LOTS of house renovation-type stuff, which is exciting. The main character in The Goldfinch is MG in the beginning and YA in the middle. So, it’s practically a children’s book. Plus there is a bird on the cover. Jules, the show is April 22. I adapted The Jungle Book. LOVE Shoe Dog – Holy Smoke he is CUTE!!!! Thanks for sharing the art. I am happy for another book to pore over, my hubby will not be happy for another book to buy – we are running out of shelf space and too many piles doubled up on the shelves! As usual – everyone is up to great stuff and it is a pleasure to read. Thanks for sharing. So glad the Nephew made it to the Swt 16! Wish him luck from us! Jules – couldn’t do without your blog. I’m grateful for so many things. And NO you didn’t come across fishing for compliments – you aren’t like that! Reading your genuine gratitude for positive feedback and encouragement was wonderful! Other writer friend of mine, whose work is liquid velvet has a short blog – a disappointment each time as I settle in for a good read. Keep it as long as you want! 1. Great weekend in San Diego with the fam, including my parents – so much to love there! 2. Visit to Balboa Park with the book The Tree Lady and my Little. We went on a tree hunt for the trees mentioned in the book and took photos at each one we found. Such fun! Thank you to H. Joseph Hopkins and Jill McElmurry for such an amazing book. 3. My dad and hubby are safe after a drunk driver slammed into my dad’s car at a red light after we got home and they were on an errand! My dad’s car is totalled. Our car is damaged. (this happened while I was writing my kicks just got the phone call (whew!). 4. Watching our Tiny crawling the lawns at Balboa Park. 5. Sharing picture book biographies of amazing women with my Little’s first grade class in the class room and in the library each week. His teacher is passing the books around to the 2 other first grade teachers too! Too tired and now too wound up to think of any more. !! Wonderful, talented, creative, dazzling art, Katherine. 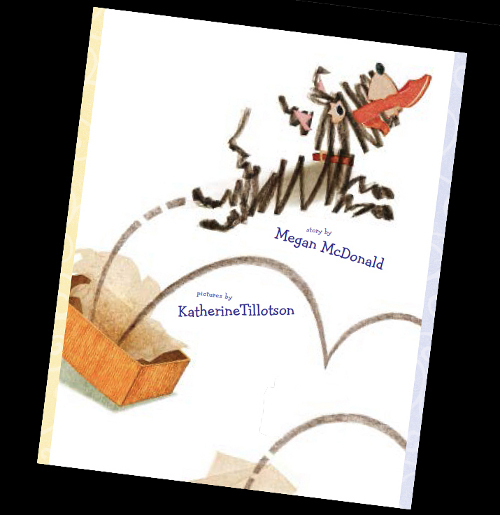 I love the bits of the story by Megan McDonald too. I can’t wait to experience this book in 3D. Julie, relevant – yes. When I was working at the newspaper, I lamented to an editor one day, that I felt we was just lining bird cages and wrapping fish with our paper. I rarely heard from readers on my illustrations. He said, “For every one note ou get, there are a few hundred other people feeling the same way.” For you my dear, I’d up that number to a few 1,000. I rarely comment, but know your blog leaves us dancing. Kudos and a deep bow again (and again) to Katherine and Megan. Allison, HOLY WHOA. Thank goodness your dad and husband are safe. Whoa again. … Also, I love kick #2 so, so much. That right there is devotion for you. I also always love hearing about your sharing biographies with others. Thanks for the nice feedback again, everyone — Hi, Wendy! Jone: You adapted it yourself? Cool! Oh and Moira, I’ll definitely have to read it. Hi Jules! Just wanted to say that my dad and hubby are fine (my dad’s back is a little stiff, but who’s complaining) and the insurance company is doing its thing. We consider ourselves lucky, so lucky. I’m thinking of sending some of the photos of us at Balboa Park with the trees to JM. Do you think she’d mind? Your sight is WONDERFUL!!! Don’t ever think those of us out here in some ‘cloud’ aren’t paying attention and devouring all you put out. 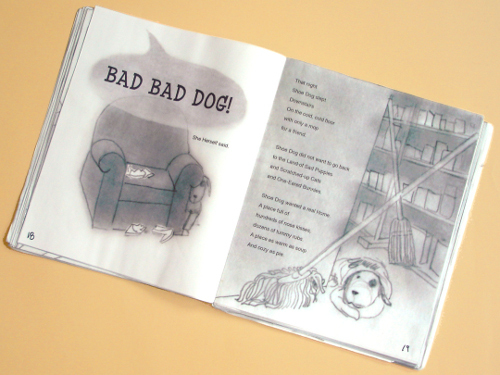 Thanks again for a great interview with “Shoe Dog’ – one and all! Keep feeding us – thanks again. Allison, glad to hear everyone’s well. And I bet Jill would LOVE that! 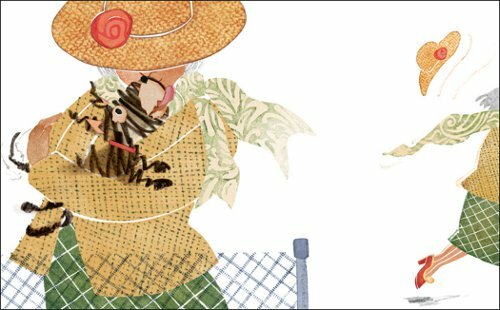 Thank you for this wonderful post about the delightful “Shoe Dog,” I loved seeing the dummy and reading about how he came to be. And I LOVE this whole site – thank you Jules for an amazing job over the long haul!